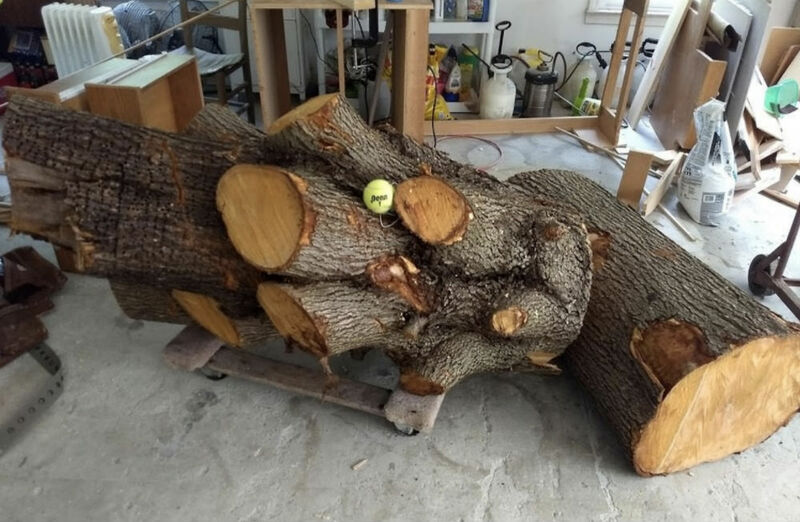 In the latest issue of Wood News Online, Bram Gallagher tells the story of milling a salvaged tree that was being taken down in his neighborhood. I was initially disappointed to find out that the tree they were felling was a Bradford pear, that despised tree that smells like rotting fish in the spring and collapses under its own weight in the winter. Still, the loggers were happy to drop it off in my driveway rather than spend an hour chipping it, so I was resolved to experiment on my new wood. I can today state, emphatically, that if you get the chance to get 400-500 pounds of green pear wood for free, you should take it. You don’t need to park your car indoors anymore. What a nice article. About 4 years ago, my dad’s huge montery pine fell over. It was 120-150 feet tall and about 4 feet in diameter at the base. Alas, I hadn’t started woodworking at the time and was at a very bad job that had my very occupied. I wish things could have been different then. If it happened now, I would have taken it to a local mill and made lots of long 2×6’s and other beams so my dad could rebuild the garage that the tree crushed. Also, I would have easily gotten a solid slab or three out of it to make a good woodworking bench in the garage. I like the thought of using local wood. It’s nicer than getting it chipped up or being used just as firewood. Despite all of the inexpensive portable sawing equipment on the market today, there is something viscerally satisfying about processing wood in an old-timey way. I would compare it to how passionate audiophiles are about listing to music on a turntable vs compressed digital. Looks like a fun project!